Despite the late course change from the boardwalk to the streets, the 2011 Long Beach Snowflake run was a great experience. The anticipated snow and sleet never arrived but it did start to mist 30 minutes into our run. I'd worn a waterproof running jacket over my shirt so that wasn't an issue. 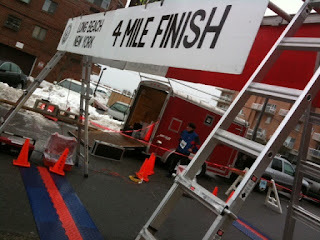 We never got the predicted snow and sleet but a steady rain started after most runners had crossed the finish line. I met up with my friend Steve who was racing for the first time today. He's a good athlete and a dedicated CrossFit practitioner so I expected him to do well despite his pre-race jitters. We headed to the line just a few minutes before the start, putting us near the back of the pack. After giving Steve some last minute coaching we were off and running but the accumulated snows had narrowed the roads and we had to contend with hundreds of other runners working their way through the tight spaces. Steve and I did our best to navigate around the clumps of slower runners and by the half mile point the road had opened up enough for us to reach cruising speed. Our back-of-pack start and congested first minutes delayed us on the first mile, that we passed at 9:05. Soon after that, Steve moved ahead and I lost track of him until I saw him heading west as we rounded Neptune Boulevard. 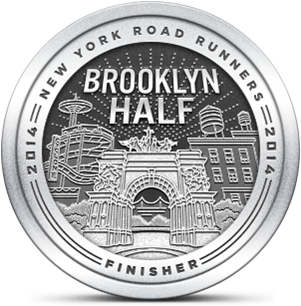 My split on mile 2 was 17:55 so I'd managed to push my overall pace just below 9:00 per mile. I decided to keep that pace through mile 3 because it felt fast enough and I could maintain that speed. At the 3 mile point I decided to step it up and passed a group of runners that I had been following for the last couple of miles. The long straight road provided a view of the finish far ahead of my arrival and once I saw it I felt I could push myself even harder. I came through the chute at 35:22 and wished that I started closer to the front. That would have cut at least 20 seconds from my time and given me a 4 mile PR. But starting point is a variable that's hard to control so I accepted my time as it was. I do like those races where they time you at the start and finish and provide both net and gun times. Steve ended up finishing around 33 minutes and was satisfied with how he did. He's ready to race again. I was happy to start my 2011 racing season with a good run and was glad to be running outdoors again for the first time in almost two weeks. I'll need to start focusing on distance as I begin my training for a half marathon in April. There are some interesting races between now and then so I'll decide soon where (and when) I'll hit the starting line for my next race. Terrific! All the best..... I'm jealous. Thanks Brian. You would have liked this race. I'm thinking about the Lazer, Aptheker, Rosella & Yedid Kings Park 15K on March 18 as a training event prior to the RXR Half. I understand it's a very hilly course so that could be a tough one. Hope you are back on the road soon.